Celebrity Support for Salmon Farm Cull! The campaign to stop Scottish salmon farmers shooting seals hit the bullseye over the weekend with celebrity support from Martin Shaw and Brian May - the latter Tweeted. Actor Martin Shaw, famous for his role in The Professionals and Judge John Deed, offered his support in an interview with The Sunday Times (12 May). Read article in full via "Seal campaigners call for salmon farm cull"
Martin Shaw found fame in the TV show 'The Professionals' as a police hard-man - never mess with a Professional! Read more via"Scottish Salmon's Seal Killers Named & Shamed!" Read a press release and media backgrounder online via "Lethal Scottish Farmed Salmon: Serial Seal Killers Named & Shamed!" Scottish Salmon's Seal Killers Named & Shamed! BREAKING NEWS from Scotland's Killing Farms! Scotland’s seal killing salmon farms are finally named and shamed following a Freedom of Information disclosure forced on the Scottish Government by the Scottish Information Commissioner. The damning data reveals that over half of the salmon farms in Scotland killed seals as a ‘last resort’ even though only 13% of sites have predator nets installed! The worst offenders are the Norwegian-owned companies Hjaltland (Grieg Seafood), Scottish Sea Farms (Leroy/Salmar), Marine Harvest (Meridian/Morpol) and the Scottish Salmon Company. GAAIA is now writing to retailers and the U.S. Government urging a boycott of ‘seal-unfriendly’ farmed salmon. Download the data online now for 2011 and 2012 and other documents via "Lethal Scottish Farmed Salmon: Serial Seal Killers Named & Shamed!" The disclosure comes despite over 12 months of complaints, refusals and delays from both the Scottish Salmon Producers Organisation (SSPO) and the Scottish Government. 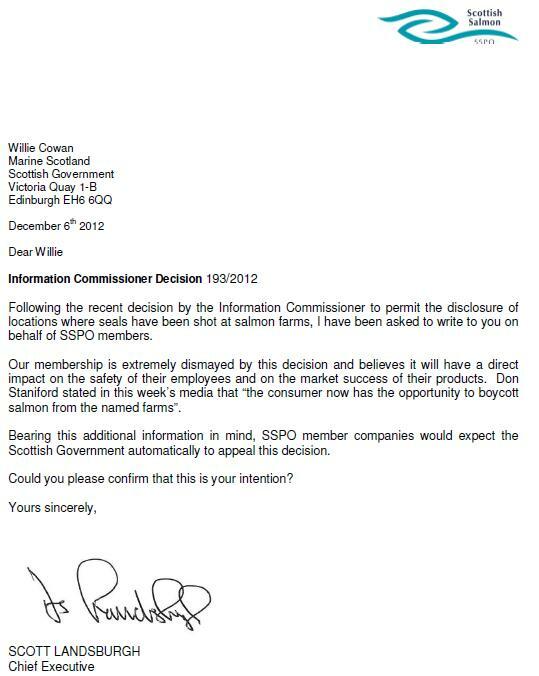 In December 2012, the SSPO wrote to the Scottish Government claiming that the release of the names of the seal-killing salmon farms would “have a direct impact on the market success of their products” (read the SSPO’s letter in full online here). In January 2013, the Scottish Information Commissioner delayed disclosure to investigate a complaint of death threats. Back in June 2012 (following the original FOI request in April 2012 filed by GAAIA) the Scottish Government named the salmon farming companies killing seals but refused to name the specific sites leading to an appeal to the Scottish Information Commissioner. Thanks to rulings in November 2012 and April 2013 upholding freedom of information the general public now know the identity of the salmon farms across Scotland slaughtering seals. GAAIA also published damning data (obtained from Marine Scotland in March 2013 via another FOI request) naming all 169 salmon farm sites in Scotland WITHOUT predator nets (download data online here). The Scottish Government admitted in a FOI reply in September 2012 that 87% of Scottish salmon farms do not even have predator nets – explaining that installing predator nets “requires employing extra trained staff and regular net maintenance and cleaning which costs money and eats into profit margins”. Another FOI reply from the Scottish Government in March 2013 detailed the 47 salmon farms with predator nets – although only 37 sites were operational and only 25 sites used the predator nets continuously (12 sites kept the nets in storage). Faced with a barrage of bad publicity in British Columbia, Marine Harvest Canada installed predator nets at a cost of $250,000 per farm but Marine Harvest and other companies have continued to cut corners in Scotland. If the 169 salmon farms without predator nets in Scotland installed predator nets it would cost the salmon farming industry £27 million ($42.5 million). Following yesterday’s FOI reply the Scottish Government immediately posted new data on Scotland’s seal killers online (read 2012 seal killings online here; read 2011 seal killings online here). Today, GAAIA wrote once again to all supermarkets asking them to stop sourcing farmed salmon from all seal-killing salmon farms in Scotland urging a boycott of ‘seal-unfriendly’ farmed salmon (read the letter online here). A letter was also sent today (8 May) to the US Department of Commerce repeating the call to ban seal-unfriendly Scottish farmed salmon under the Marine Mammal Protection Act (read the letter online here). Read a press release and media backgrounder online via Lethal Scottish Farmed Salmon: Serial Seal Killers Named & Shamed!